Specialty: Stochastic Optimization and Applications. Brief CV: Dr Yannis Marinakis was born in Chania, Greece, in 1976. He received a Diploma in Production Engineering and Management from the Technical University of Crete, Greece, in 1999, an MSc in Operations Research and a PhD, from the same University, in 2001 and 2005, respectively. 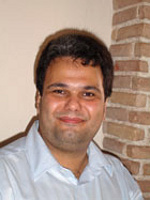 He is currently a Lecturer of Stochastic Optimization and Applications in the Department of Production Engineering and Management of the Technical University of Crete, Chania, Greece. His research interests focus on Nature Inspired Methods, on Metaheuristic Algorithms, on Supply Chain Management, on Vehicle Routing Problem, on Operations Research, on Game Theory, on Computational Methods in Optimization Problems, on Optimal and Automatic Control and on Structural Control. He teaches the following courses: Combinatorial Optimization, Game Theory, Design and Optimization in Supply Chain Management, Evolutionary Algorithms and Optimization of Large Scale Systems (postgraduate). He is the author of three books and of thirty five papers in international scientific journals. He has more than fifty papers in book chapters and in the proceedings of international and national scientific conferences. He has participated in a number of research projects as a researcher. He has been the supervisor of 19 master theses and of 38 one diploma theses. The total number of citations in Dr. Marinakis’ work is equal to 770. Education: Diploma (1999), MSc (2001) and PhD (2005) in Production and Management Engineering, Technical University of Crete, Greece. Research Interests: Stochastic Optimization, Combinatorial Optimization, Evolutionary Algorithms and Nature Inspired Algorithms, Design and Optimization in Supply Chain Management, Game Theory, Vehicle Routing Problem. Laboratory: Decision Support Systems Laboratory. Teaching: Combinatorial Optimization, Game Theory, Design and Optimization in Supply Chain Management, Evolutionary Algorithms and Optimization of Larges Scale Systems.